Entry Doors Edison NJ | Window & Door Outlet, Inc. Most homes nowadays have multiple entry points. Of course all have a primary entryway, but many will also have a door leading out to a patio or backyard area and even a door allowing for entering and exiting into a garage. 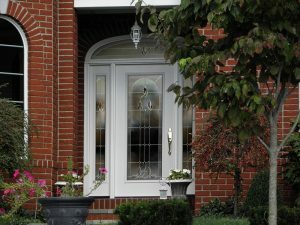 If your front door is taking away from your home’s curb appeal, or if your patio doors are no longer providing the energy performance and security you desire, look to the experienced professionals at Window & Door Outlet, Inc. We offer custom entry doors – front doors, patio doors, and storm doors – that are both attractive and built to last, and our large selection of products means that we have something that will fit every budget and suit all tastes. Homeowners throughout New Jersey can visit our 2,500-square-foot showroom in Edison, NJ, to browse the large selection of products on display and choose the entry doors that match their vision for their home. Front doors – Choose from fiberglass and steel front door systems that offer a tremendous blend beauty, energy efficiency, and security. Patio doors – Select from numerous vinyl sliding glass door options as well as fiberglass and steel hinged patio door systems. Storm doors – Pick from many different models of aluminum storm doors, including options with retractable screens. All ProVia doors are completely custom. They are available in many different colors and realistic woodgrain finishes, as well as various glass and hardware options. This allows our customers to create truly unique and eye-catching designs. Window & Door Outlet, Inc. has been selling and installing premium-quality entry doors for more than two decades, and our commitment to customer service has helped us maintain an A+ rating with the Better Business Bureau. Our factory-certified technicians will ensure that your doors are installed with precision. Once your project is complete you will be able to rest easy knowing that you will have a lifetime warranty on the door, slab, glass, and hardware and up to a 10-year warranty on the finish. Contact Window & Door Outlet, Inc. today if you would like additional information about the exterior doors we offer to homeowners throughout New Jersey. Be sure to ask about our financing options, which are available to those who qualify. To see more images of our doors visit our Gallery! $250 off when you buy any entry door — Contact Us Today!